12th Group Stage match of CLT20 2014 was played between Cape Cobras and Barbados Tridents at PCA Stadium, Mohali, Chandigarh. In a dramatic manner Corbras won the match in super over. Both teams managed to out equal score 174 runs in 20 overs. Match turned to Super over and Cape Cobras won the one-over eliminator. SA Engelbrecht (Cobras) declared man of the match for his 19 runs in 10 balls and 2 important wicket. Earlier, Cobras won the tioss and put Barbados into bat first. Barbados could not made batter start and lost 2 wickets early on team score 7 runs. EMDY Munaweera and JL Carter took the charge in hand and played superb innings. EMDY Munaweera made super quick 42 runs of 21 balls and JL Carter remained not out till end and contributed very well 111 runs of just 38 balls. other batsmen could not played well and Barbados managed to put good totals of 174 runs at the end of 20 overs. Following huge traget of 175 runs, Corbas made quick start and played aggrassive inning initially. RE Levi made quick 39 runs of 18 balls and HM Amla contributed 59 runs of 42 balls. In later over SA Engelbrecht played good cricket and made 19 runs of 10 balls but could not cross Barbados score and ended 20 overs with lavel score of 174 runs. Match turn into super over and Cape Cobras won the one-over eliminator. SA Engelbrecht (Cobras) declared man of the match for his 19 runs in 10 balls and 2 important wicket. 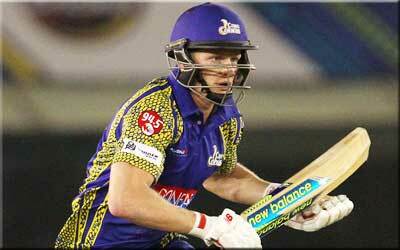 Points - Cape Cobras 4 and Barbados Tridents 0.